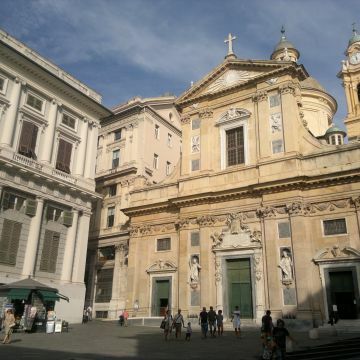 The Chiesa del Gesù in maximum expression of international Baroque in Genoa, and here are preserved works of Rubens, Vouet and Carlone. The inner part of the church represents a prestigious example of Genoese Baroque, which finds its expression in the triumph of gilded decorations, stucco and palychrome marbles, in the intrepid frescoes of the brothers Giovanni and Giovan Battista Carlone. At that time the most important noble families of the city commissioned the decoration of family chapels to the most important artists of the period. This holy place guards absolute masterpieces, like the Circoncisione and the Miracolo di Sant’Ignazio by Peter Paul Rubens and the Assunzione by Guido Reni. 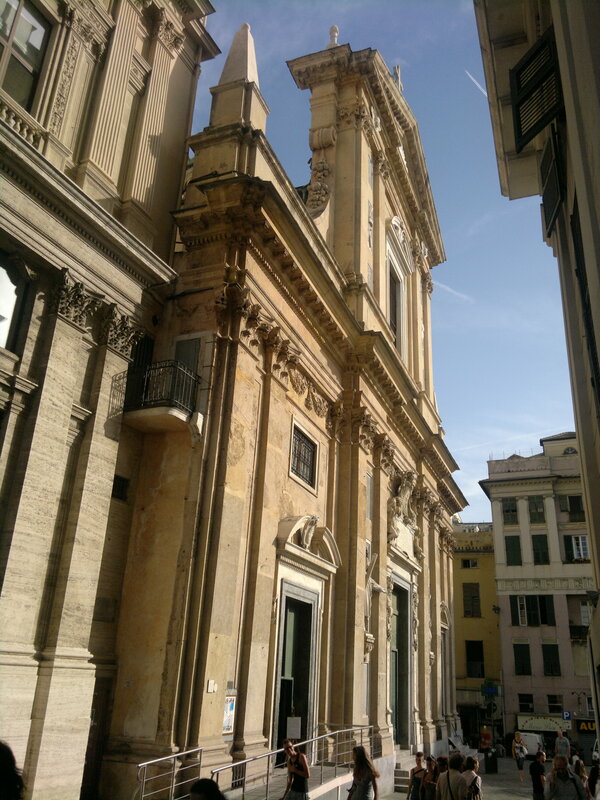 The basilica acquired its current shape and the name of Chiesa del Gesù after the big reconstruction in the 16th century thanks to the work of the Company of Jesus, based on the design of Giuseppe Valeriano, painter, architect and Jesuit priest. 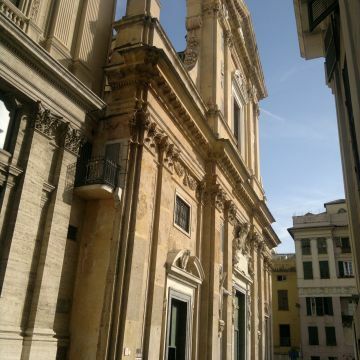 The sanctuary is dedicated to Santi Ambrogio e Andrea, because originally in the 6th century the church was dedicated to Ambrogio, bishop of Milan, who sought refuge in Genoa after the Langobardic sack of Milan by king Alboino. 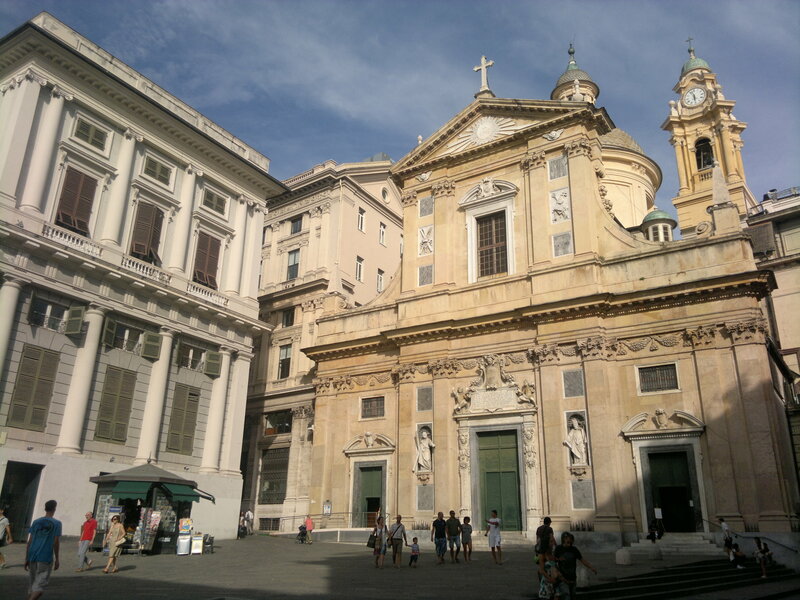 You cannot miss the paintings and frescoes by many important painters of the Genoese school and other artists. Among others: Domenico Piola, Domenico Fiasella, Valerio e Bernardo Castello, Giovanni Andrea and Lorenzo De Ferrari, Domenico Scorticone, Andrea Pozzo and Simon Vouet.